The perception of risk in coach behaviour. When Pep Guardiola commented that there is nothing more dangerous than not taking risks in football his sentiment of modern day behaviour seemed like a worthwhile consideration for coaches. In fact, being risky in our behaviour seems even more attractive when the likes of Alex Ferguson admits being a risk taker in his approach to winning games, Vicente del Bosque warns about the danger of complacency in play, and Jurgen Klopp adopted a high intense and high risk philosophy in game management. More recently Jurgen Klinsman urged the FA to take a risk in changing its developmental culture in order to impact upon the National team’s performances at major tournaments. So taking risks across levels is fashionable and advocated frivolously in the football domain. What isn’t so straightforward is the understanding of what it actually means for a coach or manager to take risks or recognise an opportunity to engage with risk and the consequence of that thinking or behaviour. The way we think as coaches about risk taking is influenced by a number of factors that largely span across different perspectives that include the context in which risk taking develops, the part that emotion plays in risk taking, and the neurological aspect of risk taking behaviours. Research that has examined the influence of emotion on an individual’s decision-making process has influenced my work when developing certain behaviours of coaches. For example, evidence suggests that individuals will generally make choices based upon their feelings which implies that coaches need to be more aware of how they feel, demonstrating more emotional attention. So it is important for coaches to understand that they should view risk by how they feel about it in addition to what they think about it. When confronted by a risk situation, coaches tend to appraise it in relation to the probability that an untoward outcome will result as a consequence of the decision to change something. This is a standard viewpoint of risk although the perception of risk in my experience tends to be much more subjective when coaches assess a certain situation. In particular, the difficulty in that others (coaches, players, support staff etc.) may have different opinions on a decision due to aspirations, beliefs and motivation can only confound the efficiency of the process and indeed an intended outcome. I have worked with coaches who have been faced with decisions that are perceived as risky at the time. I listened to the concerns of the coaches where they highlighted the, ‘what ifs’ and the inherent thoughts of regrets if the outcome was not the desirable one for them. This is something that most coaches will be familiar with when faced with a similar situation within football and a risk-aversive culture has evolved because coaches tend to be compliant in their behaviour as clubs or organisations are not likely to encourage them to take risks. Consequently, we have leaders who do not encourage risk-taking, coaches who are afraid to take risks as a result of being institutionalised, (negative) consequences for failure and a lack of adaptability to adopt a risk-taking culture. Working on the emotional aspect of coach behaviour isn’t that easy mainly because there has been a lack of educational awareness of what it actually is and how it can impact upon coach behaviour. In addition to the issue of education, the football domain hasn’t lent itself well to the openness of emotional issues to be explicitly discussed. 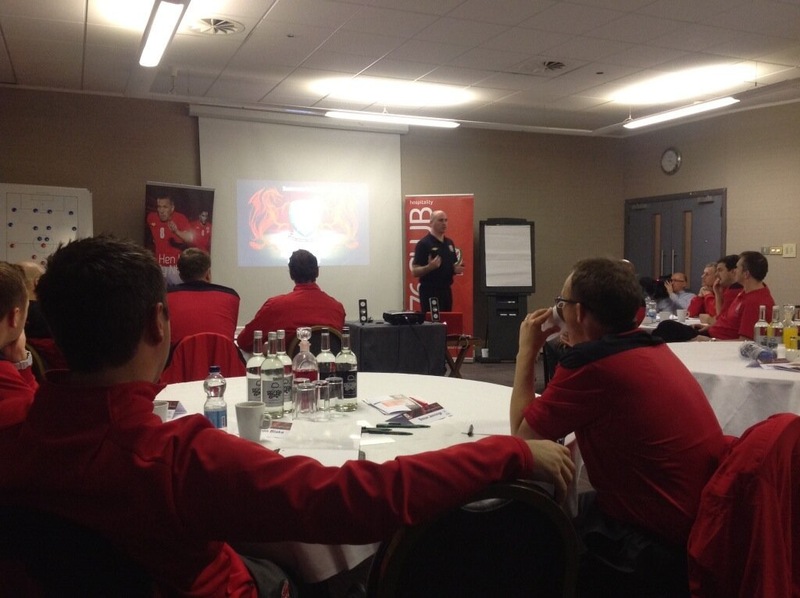 I have been fortunate to introduce and develop this aspect of coach behaviour within the current coach education programmes at the Welsh Football Trust (WFT). As my role as a coach educator with the WFT I have remained focused on coaches becoming more effective more regularly by tapping into the psychology of their behaviours. For example, on the UEFA Advanced and Professional licences I educate coaches about the importance of their personal psychology and challenge them to further understand their effectiveness through enhanced self-awareness. A large part of this work looks to develop their choice of behaviours aligned to perceptions and beliefs, needs and motives, and their emotions. This mind-set has the potential to reinforce the emotional competence of the coach through self and social awareness, and both intra- and inter-relationship management. Consequently heightened levels of this intelligence will inevitably impact upon the receptiveness of a coach and allow them to influence the outcome of interactions that occur frequently in the football environment. What is key here is that coaches have previously experienced education systems both in and outside of football that have not encouraged risk and probably to some extent, stifled the creative side of coach thinking and behaviour. I have been largely influenced in my thinking on this area by the educationalist, Ken Robinson who writes and talks about the development of creativity and innovation. Fortunately, coach education has become much more dynamic and provides a curriculum that is more aligned to the football landscape that allows the coach to consider risk and understand the key factors that may influence it. The awareness of both emotional and social intelligence underpins my applied work with coaches specifically when developing innovative and challenging behaviours such as risk. This seems even more important as research has highlighted that people can be misled during experiential thinking when emotion is heightened so competence in coach thinking and behaviour is fundamental when considering risky decisions. In an applied context I challenge coaches to explore alternatives, share their opinions and encourage opposite viewpoints that can lead to innovation and the development of a risk-taking culture. Accepting poor performance when it does occur provides opportunity to learn and coaches through sharing both good and poor performances will see the benefits of modelling risk-taking that may be apparent in other coaches’ behaviour. Educating coaches is vital in understanding risk together with acknowledging the opportunity to demonstrate risk behaviour. Aligned to education is the reward of taking risks for the coach. If one was to look at the behaviourist approach to learning then if we want to encourage risky behaviour in our coaches then we should reward it. Positive reinforcement over time develops a conditioned response such as risk-taking and a culture will evolve that will allow us to be less fearful in the consequences of our coach behaviour and inspire us to become more creative in our decision making capabilities. ← The role of psychology in sport and advances in sports science and management. Contextual intelligence: Considerations in professional football. Working in professional football: The importance of mentally tough behaviours.